"The Bells of Wilno: Marking Moments of Significance in an Early Modern City of Many Confessions and Religions" by Prof. David Frick, History Department, University of California, Berkeley. Prof. Frick provides a detailed and complex picture of social, cultural, and religious life in an early modern European town, Wilno - today's Lithuanian capital Vilnius- in the past of the Grand Duchy of Lithuania, which was one of the constituent parts of the Polish-Lithuanian Commonwealth. Prof. David Frick holds the Chair of Slavonic Languages and Literatures at the University of California in Berkeley. His research interests concentrate on Poland-Lithuania in the Age of Confessionalisation, Enlightenment in Poland, and urban history with particular focus on Vilnius. He is also respected for his research on Orthodox Slavonic Reform in the Ukraine and Belarus in the late 16th and early 17th centuries, Reformation and the Counter-Reformation in Poland, and textual criticism and cultural polemics in Muscovy in the 17th century.His many awards include fellowships from the Alexander von Humboldt Foundation to conduct research at the Universities of Bochum and Bonn, a Guggenheim fellowship, and several Fulbright-Hays fellowships to conduct research in Poland and Lithuania. Prof. Frick has also received fellowships from the American Council of Learned Societies and the National Endowment for the Humanities. 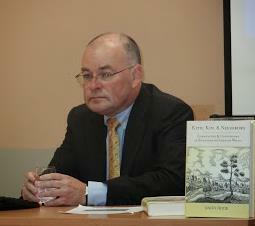 Prof. Frick has published extensively on the history of Eastern Europe and the Baltics. “Kith, Kin, and Neighbors: Communities and Confession in Seventeenth-Century Wilno” (Ithaca 2013) and “Rus’ Restored: Selected Writings of Meletij Smotryc’kyj” (Cambridge 2005) have reached a large international readership. Further important publications include “Wilnianie. Żywoty siedemnastowieczne” (Warsaw 2007) and “Polish Sacred Philology in the Reformation and in the Counter-Reformation” (Berkeley 1989).